This article will show you how to setup WordPress on the Lighttpd web server with the popular caching plugin W3 Total Cache. It is assumed that you already have setup a LLMP stack and have PHP functioning with Lighttpd. We'll be doing a lot of manual configuration to make minify and page cache work with Lighttpd, as W3 Total Cache doesn't support this web server out of the box (as it does with Apache and Nginx). We also need access logs for our site, so enable the accesslog module. Add a virtual host for the WordPress site-- make sure to replace example.com with your own domain name. Setting the "error-handler-404" to "index.php" is enough to get permalinks working. Reload the lighttpd service. Before downloading WordPress onto your VPS, you'll create a MySQL database and a user with privileges for that database. Replace wpuser and S3cRet_pass with your own values. Download the latest version of WordPress. Extract the files inside the document-root of the virtual host. You'll now have a directory named "wordpress" in this location. Rename this to the name of your domain to match value of the server.document-root directive. Change the ownership of all files inside this directory to "www-data"
Open the browser, enter your domain name and complete the installation of WordPress. We have to enable and choose a permalink structure. But before that we have a problem to solve: WordPress performs checks for Apache mod_rewrite before enabling permalinks which will fail on lighttpd. So we have to force WordPress to enable permalinks. Create a "Must Use" Plugin directory. The closing PHP tag ?> has been deliberately omitted. 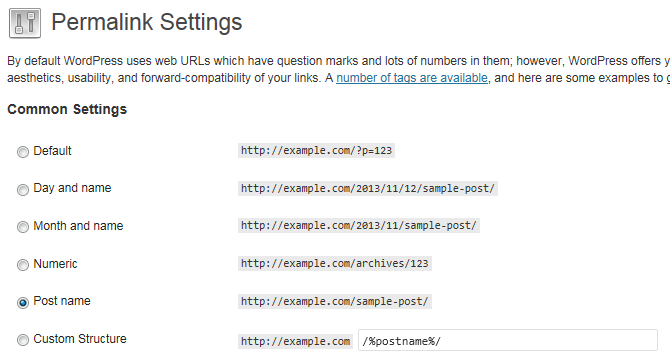 Login to wp-admin, navigate to Settings > Permalinks and choose a permalink structure. Configuring this plugin in lighttpd is different, as W3TC supports only Apache and Nginx, so we'll be doing much of the configuration manually. Install this plugin from Plugins > Add New, activate it and stop here. We won't be using this plugin's options page to set it up initially. Edit the lighttpd configuration file and add rewrite directives for minification and page caching. The additional configuration will go inside the virtual host block after the error-handler-404. Replace example.com in the /wp-content/cache/page_enhanced/example.com/$1/_index.html path with the exact domain using which you installed WordPress. 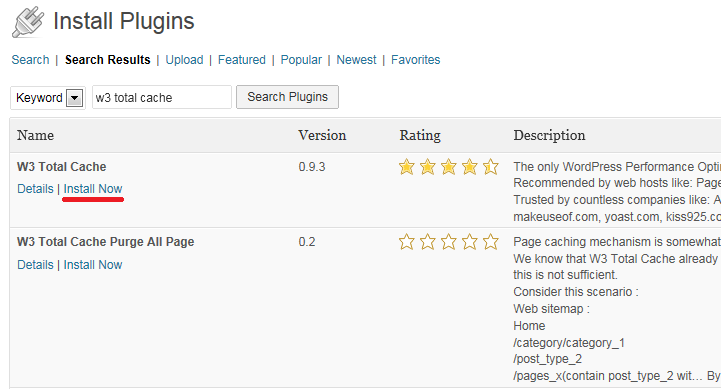 Go to the WordPress administration panel (wp-admin), navigate to Plugins > Add New, search and install the plugin. Activate the plugin and come back to the SSH console without changing any settings. 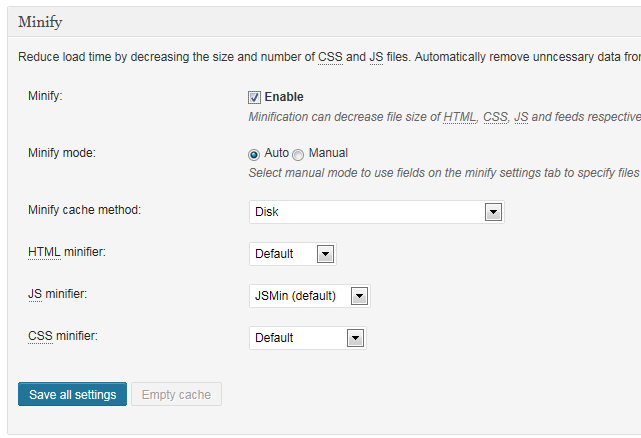 The browser cache module of the W3 Total Cache plugin creates gzipped files from the page cache and minify cache, which will be served to users based on the "Accept-Encoding" request header. But lighttpd can compress content on the fly with the mod_compress module so we'll disable this option. Using the sed command, find and replace configuration entries. This option is known to break the design of themes and plugins, so use it only if you know it'll work for you. For this article the Twenty Thirteen theme was used, which works fine with minification. Before enabling this option the "Auto Minify Test" has to be disabled. This is because the plugin requires a set of rewrite rules for the Minify Auto test to complete successfully. While we can try to convert them for lighttpd (from .htaccess or nginx.conf) it isn't worth the time, as auto minification works on the site even without these tests. Back in wp-admin navigate to Performance > General Settings and enable minify. If the design of the site looks broken, it could mean incorrect minify rewrite rules in lighttpd.conf or you've forgotten to reload lighttpd. Page caching creates static HTML files of your content and serves them to users with a rewrite rule. As we've already added rewrite rules we can enable page caching by going to wp-admin > Performance > General Settings. The default Page Cache Method is Disk: Enhanced however if you've accidentally changed it to something else you can't change it back as this option is disabled. So we need to manually modify this by editing files. This enables Page caching with Disk Enhanced. To test if it works use curl to request a page which is not cached. Execute the same request again. Notice the difference between both the headers. The first response has headers Link: and X-Pingback which are added by PHP. The second response was purely HTML so it doesn't have those headers. You can also view the cached pages on disk. To check if the site supports compression use the --compressed option of curl. Notice the Content-Length and Content-Encoding headers: the content length was previously 23659, but now it is only 4819. This type of cache tells the browser how much time it can keep objects (like images, CSS and JS) in its own cache. This requires adding the Expires and Cache-Control headers which is done using the mod_expire module. and add the neccessary configuration inside the virtual host. and check for the new headers with curl. This configuration was done on WordPress 3.7.1 with W3 Total Cache 0.9.3 and works well with these. Any future updates to W3 Total cache which changes the rewrite directory structure will break minifcation and page caching (though the latter isn't visible). So before upgrading this plugin, spin up a droplet with the WordPress on Ubuntu 12.10 image, install W3 Total Cache and check out the .htaccess file for new rewrite rules. Lighttpd doesn't allow server variables in the rewrite location so we have hard coded it.